When the Congolese government on Monday refused to accept an ultimatum from the Congolese Revolutionary Army (M23) to open negotiations and accept a buffer zone, Kinshasa opened the door for the fall of the provincial capital of Goma and with it the potential collapse of the government. In spite of a dire narrative of a possible bloodbath at the hands of M23 fighters promoted by international media and human rights groups, the M23 were welcomed "like war heroes," according to an Al Jazeera report posted on YouTube. "There was no armed conflict and the United Nations retreated peacefully." The question remains as to why the Congolese government would not negotiate with the rebels and continues to blame Rwanda and Uganda for what amounts to a failed Congolese state. M23 consists of former National Congress for the Defense of the People (CNDP) soldiers who defected from the Congolese army in April 2012 due to lack of pay and decent living conditions. Salaries, when they were paid, amounted to less than $100 per month for a senior officer. In addition, the tenets of the March 23 Goma Peace Accord between the Congolese government and the CNDP have never been fulfilled, and this is the genesis of the current crisis. While addressing an enthusiastic and supportive crowd at the Goma soccer stadium this morning, M23 spokesman Lt. Col. Vianney Kazarama of the M23 vowed to push on to Bukavu and Kinshasha and overthrow the government. The BBC reports that Karazama asked, "Do you want us to march to Kinshasa?" The crowd shouted back: "Yes!" 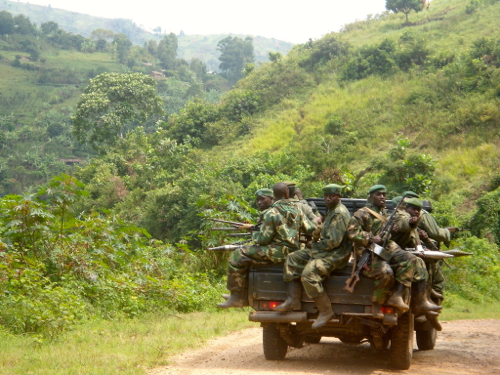 Meanwhile 2,000 former Congolese soldiers (FARDC) registered with the rebels, as well as 700 provincial police. Their main concern? They want to be paid. See the following video clip from earlier today. 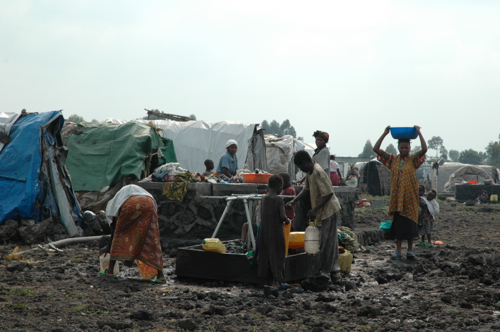 The people of Goma and the dispossessed of eastern Congo are weary of conflict and feel abandoned by their government. They want protection and rule of law and M23 is offering that tantalizing possibility. See the following Al Jazeera report. That is why it is puzzling that US State Department (DOS) spokesperson,Victoria Nuland, issued a press release condemning the rebels and calling them "an affront to the sovereignty and territorial integrity of the DRC and in violation of international law." Perhaps it was pressure from the US that caused Ugandan President Yoweri Museveni and Rwandan President Paul Kagame to issue a statement that even if there were "legitimate grievances by the mutinying group known as the M23, they cannot accept expansion of this war or entertain the idea of overthrowing the legitimate government of the DRC or undermining its authority." Where was the condemnation from DOS when a team of police and village youth in Masisi found the body of six women and a baby on Friday, November 3? The victims were killed with machetes while in search of food for their families. Nyatura Hutu fighters, allies of remnants of the 1994 genocidaires (FDLR) were singled out in this massacre, Radio Okapi reported. M23 has been fighting against the FDLR since the days of its incarnation as the CNDP. Where was the condemnation from DOS when MONUSCO (UN in Congo) issued a separate press release revealing that 264 civilians, including 83 children, were arbitrarily executed by armed groups in Masisi between April and September 2012? "Many victims were hacked to death with machetes while others were burnt alive in their homes. The opposing Nyatura group was found to be responsible for other human rights violations, including killings, sometimes carried out in collaboration with the Democratic Forces for the Liberation of Rwanda (FDLR). Where was the outrage from DOS one year ago when seven people were killed on December 19, 2011 in the town of Bukumbirwa in Walikale territory? Village leaders told Radio Okapi the murders were committed by rebels of the Democratic Forces for the Liberation of Rwanda (FDLR) in retaliation against the death of Colonel Sadiki, an FDLR officer murdered by a Congolese militia last November. Where was DOS when the leaders of Walikale called for help when the FDLR put 49 citizens on an assassination list? The list included cultural leaders, chiefs, local government officials, businessmen and women, and political leaders. Leaders said that when the people of Walikale asked for help from the Kabila government in Kinshasa, "Congolese forces (FARDC) arrive and engage in violent and inhumane treatment of the people of Walikale." The issue of the FDLR remnants of the 1994 genocide has never been fully addressed by anyone except Rwanda and the M23. What is the U.S. interest in siding with the corrupt regime in Kinshasa? Look no further than oil in Virunga and U.S. and United Kingdom mining concessions in eastern Congo. I saw how villagers lived in CNDP controlled territory in 2009 and it was a complete contrast to what I read in the media. Sometimes you just have to believe your own eyes. I am an American first, but I am disheartened and disappointed at the response of the United States. In 2009, I received a request from an aide to Secretary of State Hillary Clinton. It read, "You seem to know a lot of people on the ground (in eastern Congo)," and went on to ask for suggestions of organizations that Clinton's office could contact. I spent a week organizing contacts to Congolese human rights organizations, midwives, community leaders in the IDP camps, church groups, and others who would offer an accurate narrative. Clinton chose instead a photo-op with President Joseph Kabila and a dog and pony show at Heal Africa. Still, upon her return, Clinton issued a hopeful press release where she indicated she went to Goma to send a clear message, "The United States condemns these attacks (crimes against humanity) and all those who commit them and abet them." Since the beginning of 2012, the conflict has uprooted close to 650,000 people in North and South Kivu provinces, according to UNHCR. More than 40,000 people have fled to Uganda and 15,000 to Rwanda since April. More than 1.7 million people are IDPs, of whom some 72,000 live in spontaneous camps. The displaced are still there, still waiting. Waiting for a government to offer the rule of law independent of puppet strings that extend outside of Africa. The Congolese Revolutionary Army at least offers hope, and you can see that hope in the video clips that are flowing out of Goma.